A speedier version of “mudding” or “rock crawling” or riding an out-of-control roller coaster… call it what you may, but all you need is an afternoon to spare. 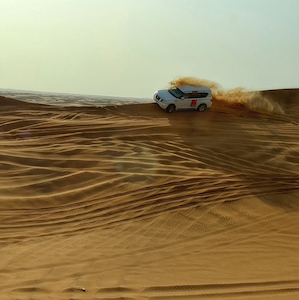 A 60-minute drive in a luxury SUV from Dubai to a small roadside village is the easy start to this incredible adventure. Along the way you get to enjoy the endless beauty of wave after wave of golden sand dunes on either side of the freeway. A 20-minute stop allows you to stretch your legs while the drivers deflate the tire pressure of the SUVs to about 30% of normal. Deflated tires, one might ask? Apparently, this strange exercise helps stabilize the vehicles while being driven at 30 to 40 miles per hour over undulating sand dunes with wheels endlessly spinning out of control. The ride itself is an experience of a lifetime. However, from a photography standpoint, capturing a slice of this fast-moving action is doubly satisfying. Coming away with a nicely-composed, sharp image is not an easy task by any stretch of the imagination. You could accomplish this in one of two ways. The easy and boring way is to be a spectator standing at a safe distance catching the action. Nah! Wouldn’t that be unexciting and lacking adventure? Just buying a picture postcard instead would be a better option. Aren’t you in this for the excitement, too? Well then, you need to be part of this thrilling ride and be willing to contort your body to ensure that your camera is always facing the action while your entire body is being violently bumped from side to side. One has to hold on for dear life just to come away in one piece. The crashing and bucking seems to last forever… a thrill-a-second experience never to be forgotten. 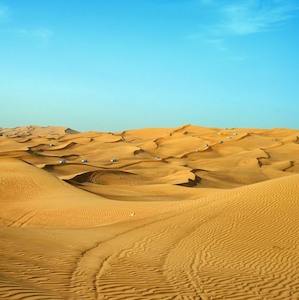 This is only a small portion of the desert safari. Also included are various stops for sunset photography, camel rides, belly dancing, bar facilities, henna painting, and a sumptuous dinner in the middle of the desert under a star-speckled, clear sky. All for approximately $100 — and in less than six hours you are back to the hotel.